There are many problems with this theory. And the theory itself still does not answer many important questions - Such as where did all the matter in the universe come from? If all the matter in the universe was compressed into a small dot, what caused this to happen? Where did gravity come from that held it together? If this "dot" spun rapidly until it exploded., then where did the energy come from to start the spinning? Also, in an environment without friction you would have this spinning dot going so fast it would then explode. If this happened, then all of the particles and matter being expelled from this "spinning dot" would all have to spin in the same direction as the dot they exploded from. This is a known law of science, which those who believe in Evolution cannot do away with. It is known as the Conservation of angular momentum. This matter which is said to have created the planets would all need to spin in the same direction as the object it came from. So therefore, all of the planets should be spinning in the same direction. However two of them are not. Venus and Uranus spin backwards. Some planets even have moons that not only spin backwards, but travel backward around their planets. "matter cannot be created or destroyed"
"Somewhere between 18 and 20 billion years ago, all of the matter in the universe was compressed into a tiny space no larger than the dot on a page. This dot spun faster and faster until it exploded, thus creating the Universe and everything in it." "There are many problems with this theory. And the theory itself still does not answer many important questions - Such as where did all the matter in the universe come from?" "If all the matter in the universe was compressed into a small dot, what caused this to happen? Where did gravity come from that held it together?" The extreme heat and pressure. It causes atom nuclei to fuse, forming a larger nucleus. "If this "dot" spun rapidly until it exploded., then where did the energy come from to start the spinning?" If you pick any region from this early Universe, it had a slow net spinning motion. When they fused (Because like said, the extreme heat and pressure caused so to happen, just like it causes atom nuclei to fuse, forming a larger nucleus), it continued to spin. "Also, in an environment without friction you would have this spinning dot going so fast it would then explode. If this happened, then all of the particles and matter being expelled from this "spinning dot" would all have to spin in the same direction as the dot they exploded from. This is a known law of science, which those who believe in Evolution cannot do away with. It is known as the Conservation of angular momentum." Indeed. According to the laws of physics (Conservation of angular momentum, in particular), when a piece comes of a spinning object, that piece must spin in the same direction. "This matter which is said to have created the planets would all need to spin in the same direction as the object it came from. However, Venus and Uranus was spinning backwards. However, what you don't understand is that, according to the theory, Venus and Uranus was created by core accretion (Which is widely accepted). Rather than lighter elements, such as hydrogen and helium, fusing together with other ones, forming heavier elements, they were blown away by solar wind, leaving us with heavy and solid materials. Afterwards, they merged into small terrestrial planets, such as Venus. Also, most christians and theists believe evolution is the big bang, or the creation of the Sun. No. It is simply "change over time". "matter cannot be created or destroyed""
Yes, indeed. According to the laws of thermodynamics (Conservation of energy, in particular), energy can neither be created, nor can be destroyed. However, the theory does not violate that law. All the matter in the early Universe merged. It was very compact. Then, BOOM! All that matter distributed themselves into areas without mass. Yes, indeed. According to the second law of thermodynamics, everything tends towards disorder. And that is true. 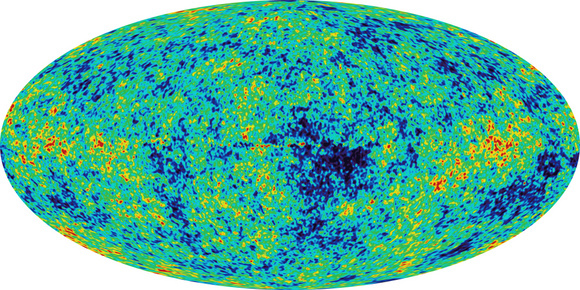 Our Universe, compared to the early Universe (Above) is not homogeneous. Supernovas, for instance. Supernova 1604, also known as Kepler's Supernova, Kepler's Nova or Kepler's Star, was a supernova that occurred in the Milky Way, in the constellation Ophiuchus. Appearing in 1604, it is the most recent supernova to have been unquestionably observed by the naked eye in our own galaxy, occurring no farther than 6 kiloparsecs or about 20,000 light-years from Earth. Also, SN 185 (aka RCW 86) was a supernova which appeared in the year 185 CE, near the direction of Alpha Centauri, between the constellations Circinus and Centaurus, centered atRA 14h 43m Dec −62° 30′, in Circinus. This "guest star" was observed by Chinese astronomers in the Book of Later Han, and may have been recorded in Roman literature. It remained visible in the night sky for eight months. This is believed to have been the first supernova recorded. And because of those natural occurences, our Universe now does not look as complex as it was a long time ago. Indeed. Extreme heat and pressure causes atom nuclei to fuse, forming a larger nucleus.